I remember the day I got my invitation to join Pinterest. It was odd to me that any site would have an “invitation only” process to join – which piqued my interest even more. Now, I can’t imagine life, work, home, or business without it. 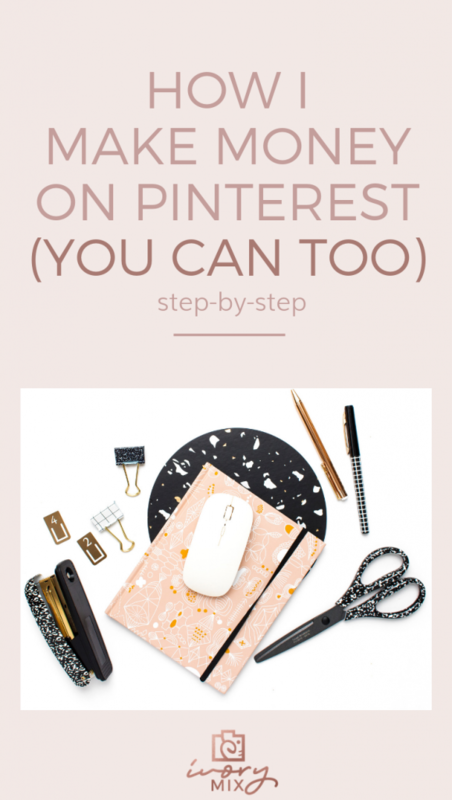 Pinterest drives traffic to my website, blog, products, and affiliate links every day, all day, and to the tune of 60%+ of my overall traffic and I’m not alone. Without Pinterest, many creative brands like myself wouldn’t be where they are today. According to Pinterest as of September 2018, over 250 million people each month are now using Pinterest to discover and do what they love. Who knows if I would have been able to take my business full-time without the platform? 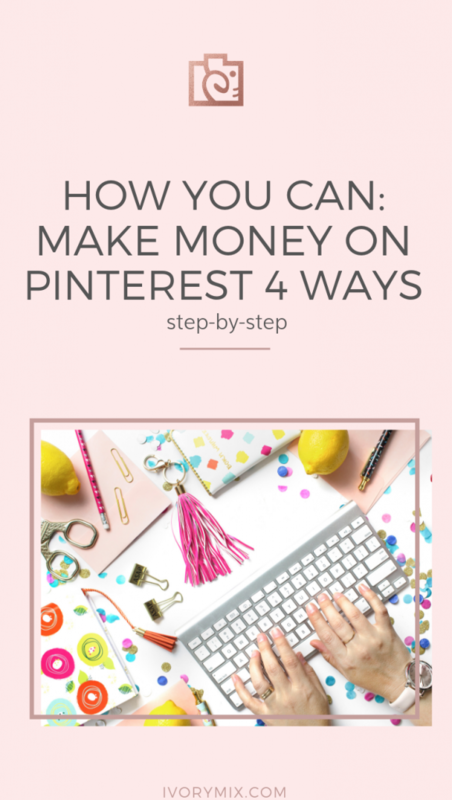 This is why I want to share with you the 4 different ways you can start making money using Pinterest as the catalyst for sales and income. I personally use each one of these strategies and I regularly have 5 figure months. 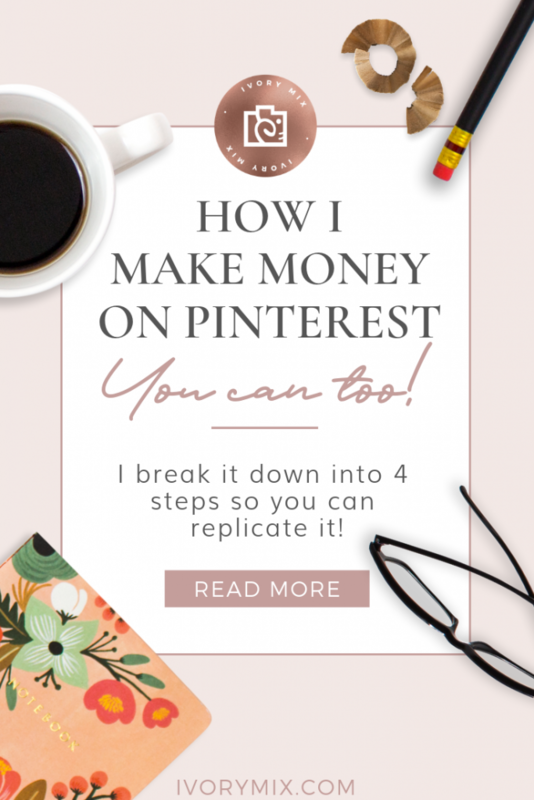 Now, if you’re not yet an entrepreneur – then me talking about how much I make from Pinterest probably sounds strange and even icky! EW AWKWARD – I get it! 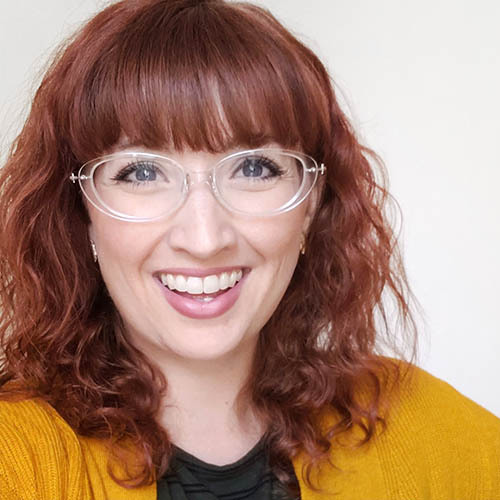 But, if you are a creative trying to grow your thing into a thriving business, then 6 figure years and 5 figure months may mean breathing a little easier. It means freedom. Peace of mind. 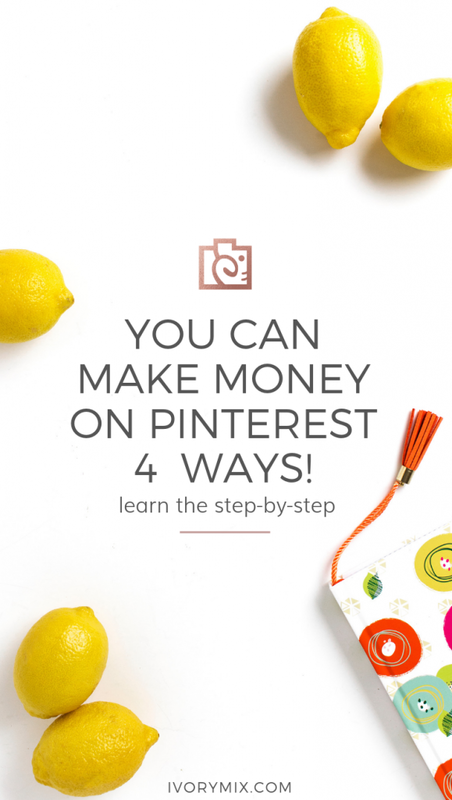 Making money on Pinterest doesn’t just mean a little spending cash for more things. For me, it means being able to stay home while I work for myself so that I have the means to pick kids up from school every day. (a luxury I didn’t have before). 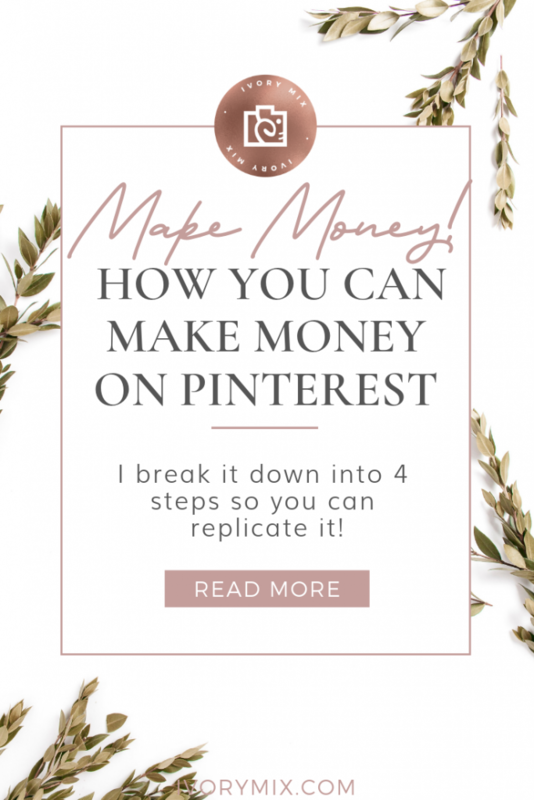 I’m not bragging about the income, I’m begging you, that if you want to breath easier – take the time to read this and learn the steps to making money on Pinterest so that you can make whatever magical dream you have come true too. 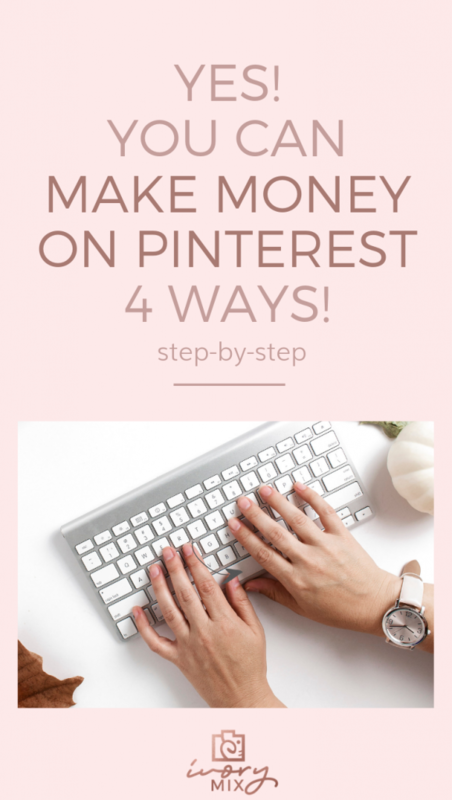 There is a myriad of ways to monetize your Pinterest presence (with or without a blog). 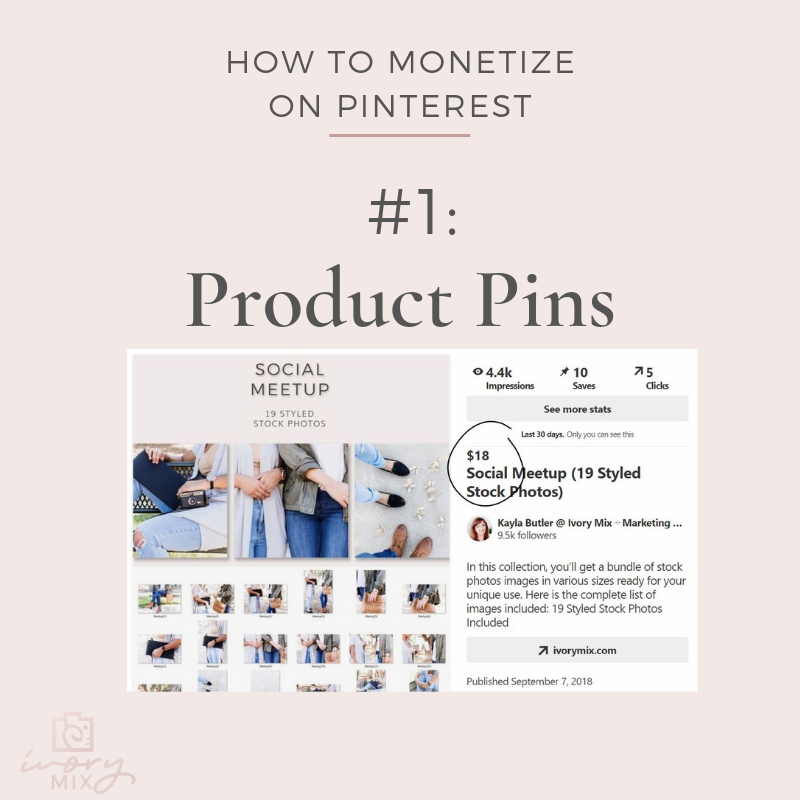 One of the most widely used and common methods for monetizing Pinterest is through brand awareness type pins, product pins, or promoted pins (advertising). Say for example you launch a product on your website. You can leverage the power of the visual-centric pins by posting an attractive image of your product or service that you are currently offering. This visual alone can capture a pinners curiosity and get them to click the pin. Once they click, they’ll likely be sent to your product sales page where they just may make a purchase. In order to enable a “product” pin, you first have to verify your website and enable “Rich Pins” but all of this is simple enough. You can verify your website and learn how to enable rich pins by reading more here: How to get verified on Pinterest. Buyable pins are a bit different. They allow pinners to make purchases right inside the Pinterest platform without leaving. This is currently only available to a select group and you must apply to be accepted. 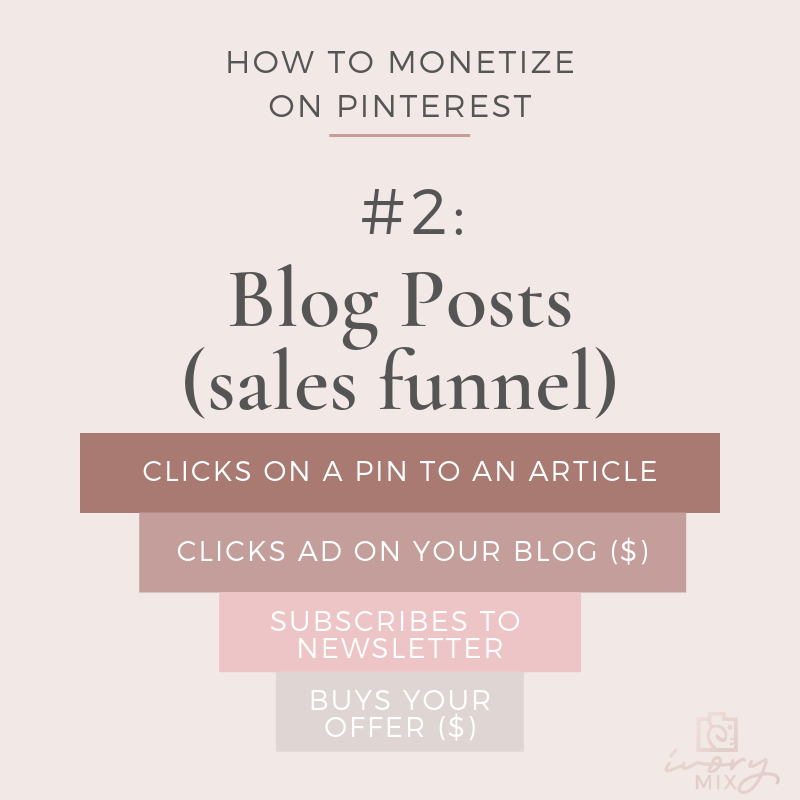 Another way to monetize your Pinterest presence is to drive traffic to your blog or website. 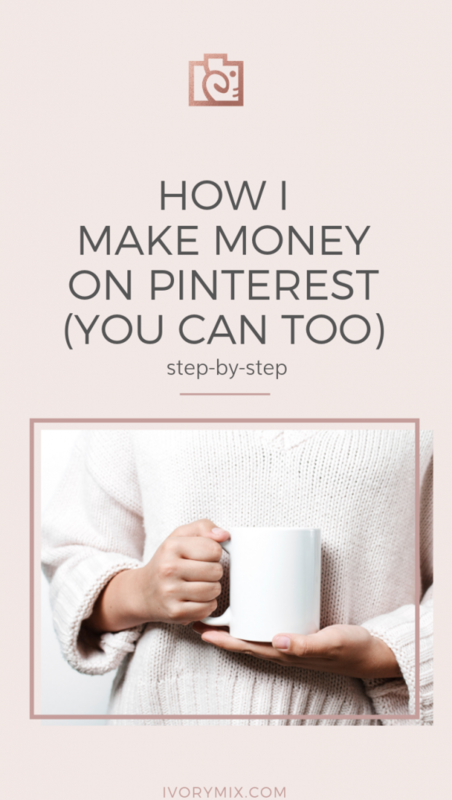 Bloggers can also earn money through Pinterest using this method because most blogs monetize their content through advertising (or a sales funnel). Programs for displaying ads like Media.net or Adsense is just one example of how bloggers can earn money through advertisers. If your blog gets enough traffic, a percentage of those visitors would click on one of the ads that you display and that’s how Mediat.net/Adsense and other ad serving company pays the owner of the blog. A high number of visitors equates to more click on the ads that you serve. This, in turn, translates to higher earnings from you ad supplier. As for bloggers sending clicks through a sales funnel, this is a little trickier. You first have to have a product you’re promoting (here’s an idea of products you can make/sell) Second, you must have an email sign up form where visitors are giving you their email in exchange for something free. For instance, visitors to my blog provide their email to me in exchange for free stock photos and monthly updates with new free photos and visual marketing trends in a newsletter. Those subscribers are then added to a sales funnel. To learn more about email and sales funnels, you should read this in-depth article here: How I make $1k in a day without a new blog post. 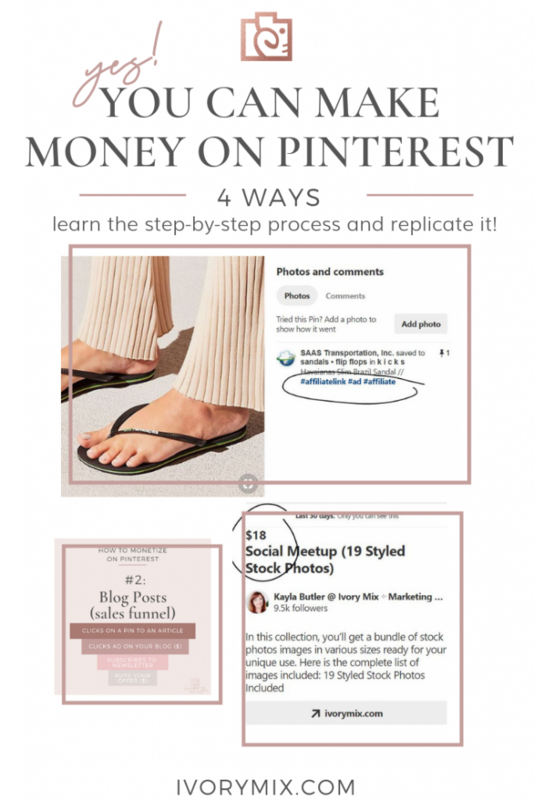 Everything we have talked about so far, are ways to “passively” monetize your Pinterest profiles. 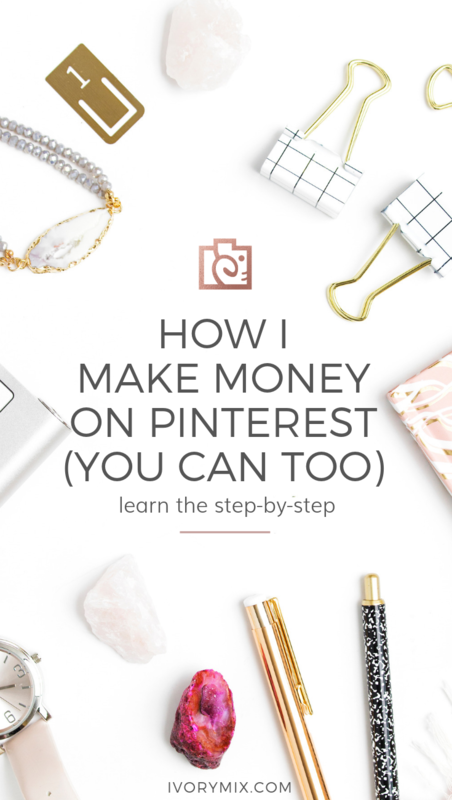 What we will tackle next is how to directly monetize your Pinterest presence. One of the most widely used methods we’ve already discussed is pinning a product pin or a shoppable pin from your e-commerce website. If you are in fact creating and selling a product, you should consider leveraging the high engagement rate of other users in your niche on Pinterest and asking them to join your affiliate program. These pinners will then promote the products that you are selling in blog posts and etc to promote their affiliate links which help you make more sales. Yes. You do have to manage an affiliate program but the additional sales should more than cover the time it takes to manage. If you sell digital products like ebooks, there are many ways to sell and run affiliate programs for your products. One of the programs I’ve used and recommend because of it’s easy to use / user-friendly interface is Sendowl. SendOwl makes it easy for you to sell digital products directly to your audience from your blog, social media or anywhere you can paste a link. Another great option for online course creators to create affiliate programs is Teachable. 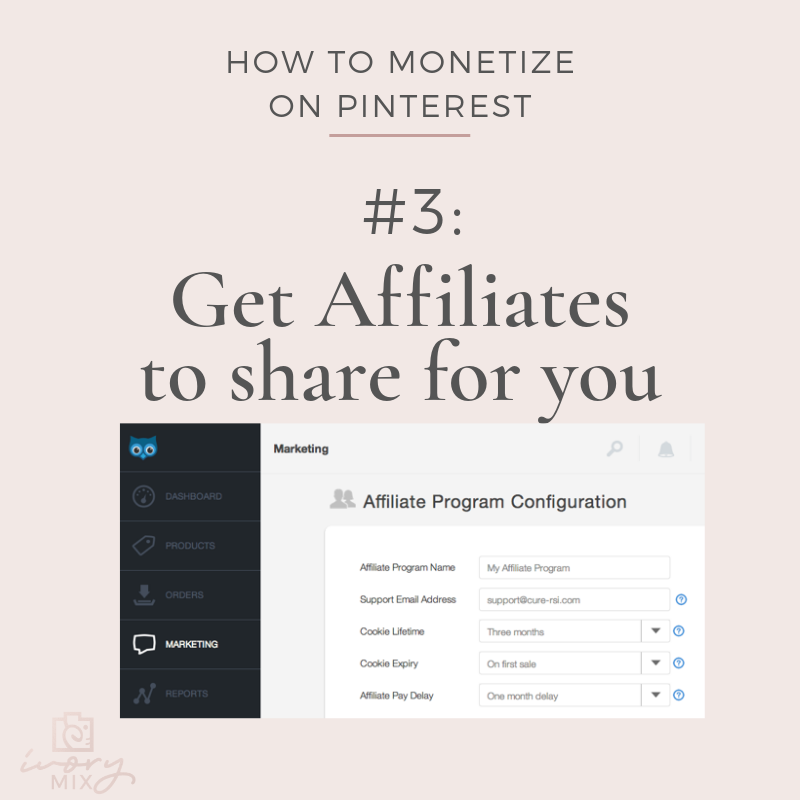 If you want to make money on Pinterest without a blog, or a product of your own, or e-commerce site and are scratching your head wondering how to actively monetize your presence on Pinterest, then you can try affiliate marketing. You earn money through Affiliate Marketing by way of commission. Using affiliate links is fairly easy. Just get the link from your affiliate program and use it as the link for your pin. The link would contain all the information the e-commerce site would need to track sales lead that came from you. If a lead turns into a sale, you get a commission for referring that customer over to the site. In the past, Pinterest had removed the ability to share affiliate links, but has improved their spam detection and brought it back. You can read the details here: Affiliate links are now allowed on Pinterest. The key here, before you get started, is making sure you are being as transparent about your relationship with a brand as possible, and follow all relevant laws and regulations. If you’re in the US and partnering with brands to promote their products or services, make sure you consult the Federal Trade Commission’s Endorsement Guidelines. Where can you find affiliate products to promote on Pinterest? Finding products to promote is not always an easy chore. The rule of thumb is, only promote products that you yourself would buy and that fits into your niche. This way, you build credibility with your audience. Not only it is good for your cred, but it will also boost your trustworthiness as a promoter. One of the ways I get affiliate links for products I use is through shareasale.com. 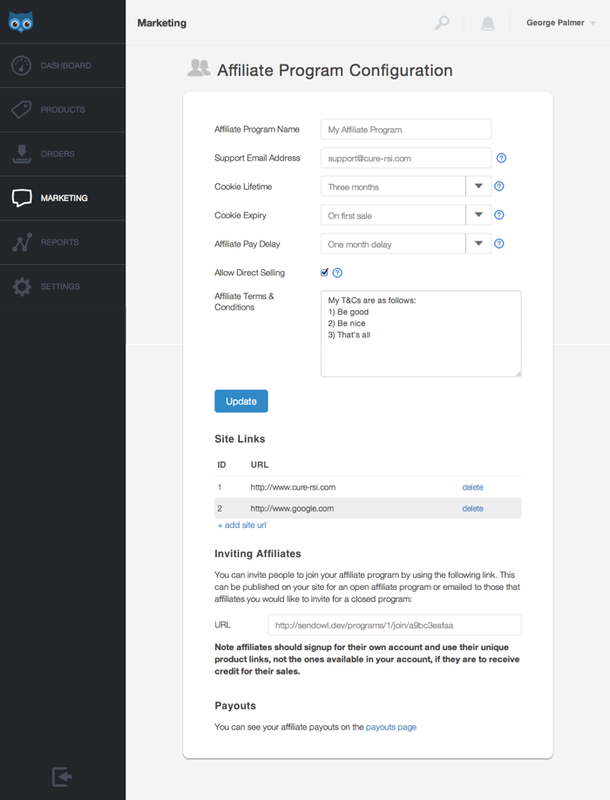 Most big e-commerce websites have affiliate programs and many share their affiliate links with influencers and content creators using shareasale.com. Amazon, however, they have an affiliate program that you can take advantage of on their own website. 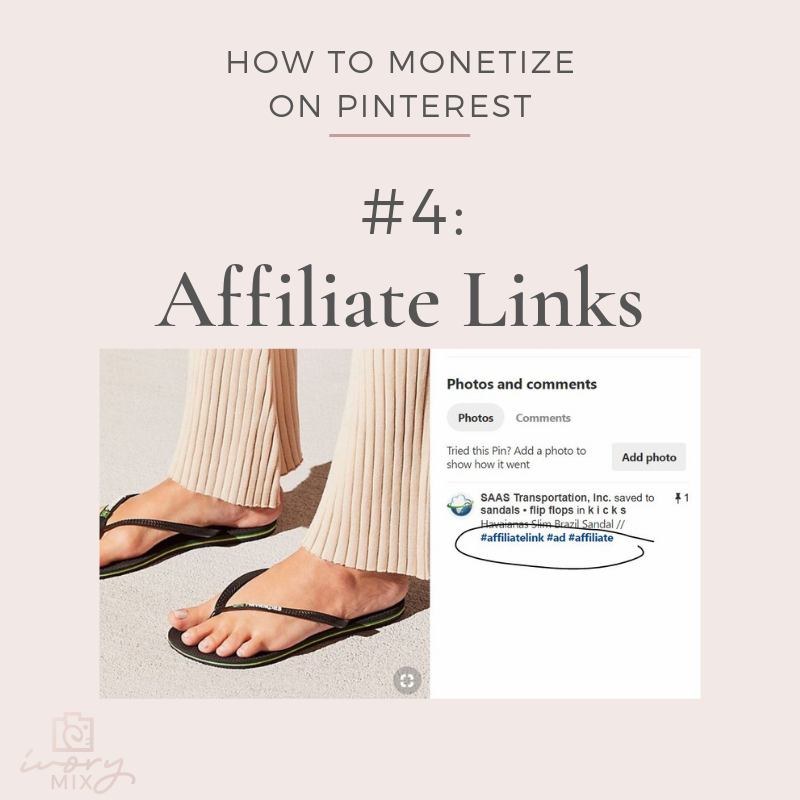 DISCLAIMER: be careful not to start sharing affiliate links to Pinterest without reading the Terms through both Pinterest and the affiliate program you are part of. The problem is that Amazon in the US has not officially posted instructions OR approval to start promoting on Pinterest. There are many conflicting reports as to the ability to share affiliate links from Amazon on Pinterest or not. As for those readers in the EU, you can see that Amazon has posted this: Affiliate links are allowed on Pinterest. It’s my recommendation that if you want to share Amazon links, you should send visitors to a landing page, blog post, or some other page on your own blog or website that contains relevant affiliate links from Amazon. 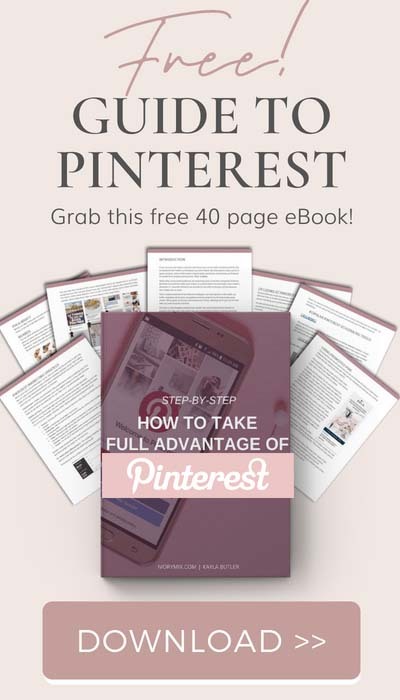 This ensures a seamless and hassle-free affiliate promotion through Pinterest in case Amazon OR Pinterest ever decide to change their affiliate link policies. Plus, you’ll have more of an opportunity to grow your brand awareness and email subscribers with people who click through to your pages. 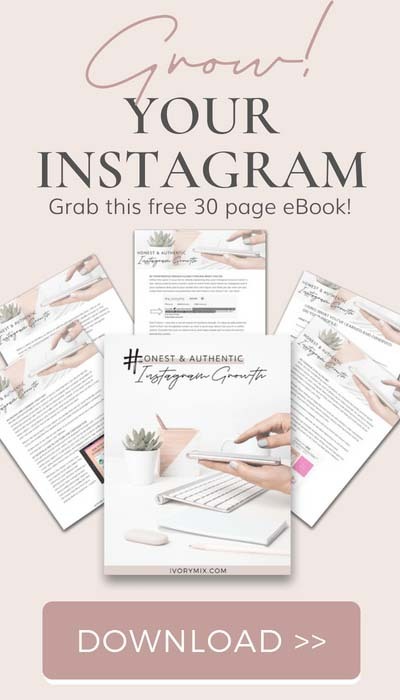 This can help you get future affiliate commissions because you can encourage your new Pinterest click through audiences to the subscriber and enter your sales funnels for products you promote or create. Of course, it goes without saying that the image of the product you are selling should be of high quality. You should make it a habit to always post pin images that are known to get clicks of whatever blog post, product or service you are sharing. Pinterest is all about imagery so think of that fact when you are deciding what image to attach to anything that you are selling. 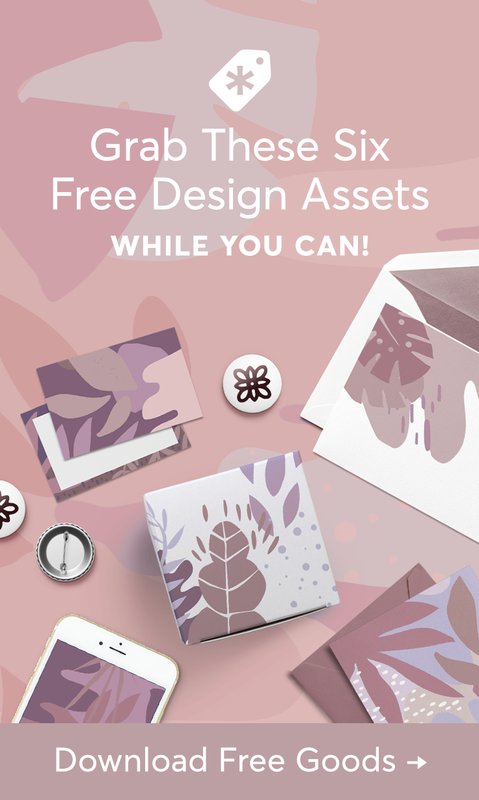 If you do create digital products, online courses, or services, you should take the opportunity to grab our free stock photos and read more here about the 5 ways to design clickable pins.